← What Can Pregnant Women Eat And Do? Is (Rolled) Oats Related To Superman? Oats and super duper good, right? It says oats on it, so it must be good for me (don’t mind the bowl of sugar in the front there, that’s just the sugar that’s in it. Not that much is it?) for breakfast. A breakfast that is so fast that you don’t even need to microwave it anymore. Don’t need to take a bowl out of the cupboard. I am actually amazed it doesn’t come with a spoon (does it? I don’t think so!). Next step on the fast breakfast ladder is intravenous or in tablet form (that might already exist I guess). How busy are you, really? When I make oats, the few times that happens, it doesn’t take long to walk to the kitchen, take the bowl out, pour some rolled oats in, then a little water from the tap and put it in the microwave for 90 seconds. It takes more time boiling the kettle for a cup of coffee. And it takes about the same time as putting three eggs in a frying pan and stirring around until cooked. With some cheese. Tasty cheesy scramble – tastes better than oats any day. But hey, back to if oats are actually super or not. Well, I don’t think the oats above are in particularly super, as they are refined, got lots of sugar added and your blood sugar levels will rise sky high after breakfast and fall fast shortly after and you will be peckish at 9:30AM wanting a chocolate muffin with your coffee. So if that’s the type of oats you’re having, then no – they are not super. If you have rolled oats and add lots of sugar, dried fruits, berries, honey, banana or brown sugar (come on, it’s all sugar), then no, not so super anymore. But they started out good. Rolled has been steamed and (you guessed it) rolled. The steel-cut ones have just been (that’s right) cut up (with a piece of steel I guess?). If you walk down the ladder, you’ll find instant oats, that have been bashed and processed into something that takes little time to cook and tastes sweet. So, you’re best choices here would be the Mr Rolled and Mrs SteelCut. You can use Groats as well, but it might be a little shock to the system going from dessert (or instant oats if you like) to the mother of all oats. So maybe Rolled would be a good place to start. Now, I think I did mention this, but since you are sitting there with a beautiful bowl of clean rolled oats, don’t put your spoon in the sugar. Stop it! Take it back out! If it just doesn’t taste good to you, how about using some honey? That’s still super sweet. Or maybe a banana? And some cinnamon? Just not sugar! Because, that doesn’t make oats super anymore. Oats claim to be high in protein, although they are mainly all carbs (which is why I reckon they are not the most super of all super foods). They’re full of zinc, calcium, magnesium and iron (if you have vitamin C at the same time, this helps to absorb it better. An orange with your oats perhaps?) and also contain essential fat. I had no idea there was fat in oats. Oats are good for stressed people as there’s plenty of Vitamin B in oats, to support your nervous systems and keep your energy levels up. Vitamin B is good for your nails, hair and skin too, bonus! 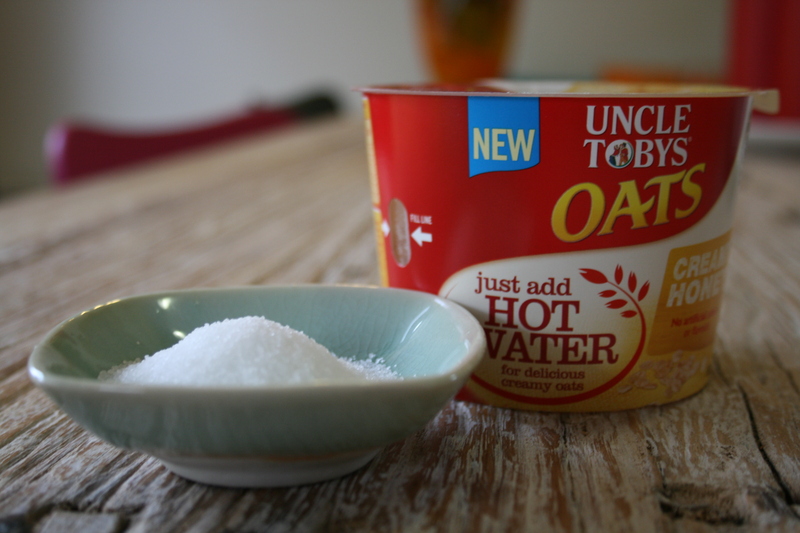 Of course, you will find a lot of soluble fibre in oats, good for your intestines (not too much fibre though!). But you can find fibre in better sources that oats, can’t you? Due to the fibre, it’s meant to lower your cholesterol. Question is, do you need to lower your cholesterol? And last, but not least, you can take oats with you in the bath and it will help your psoriasis. I have never tried this. It sounds a little messy. Have you tried? Can you please share your experience? So, the selling points for Super Oats is the fibre, it keeps you fuller for longer due to low GI and it’s fast. But is it really that super? If you’re keeping your carbs low, you can still have some oats. If you’re avoiding carbs altogether, you’re not eating much at all, maybe you should have some oats? If you’re lifting weights, oats are good before and after. If you like something warm for breakfast, oats are good (but so is cheesy scrambled eggs). If you feel bloated after having oats, maybe they’re not super for you? If you feel on top of the world and are full until midday after your oat breakky, then maybe you have found your super breakky food? In the end of the day, what’s super for you, is up to you and not me (or the media or your doctor or the marketing experts that works for Uncle Tobys). This entry was posted in Interesting Things About Food (Mostly) and tagged Best breakfast, blood sugar levels, Breakfast, Carbs, Delicious, Food, Groats, Healthy Lifestyle, Homemade, If It Makes You Feel Good It Can't Be That Bad For You, Instant Oats, Is oats the best for breakfast, Natural, Oats, Processed, Rolled Oats, Steelcut Oats, Sugar, Superfood. Bookmark the permalink. 26 Responses to Is (Rolled) Oats Related To Superman? Many of them should probably be sitting next to the chocolates as they contain just as much sugar, if not more! Sadly, marketing is key and they make the products to make money, not to make us healthy! I like your similitude as a super food. I think oats are ultra healthy too! If you love something, why change it? 😉 Thanks for reading! 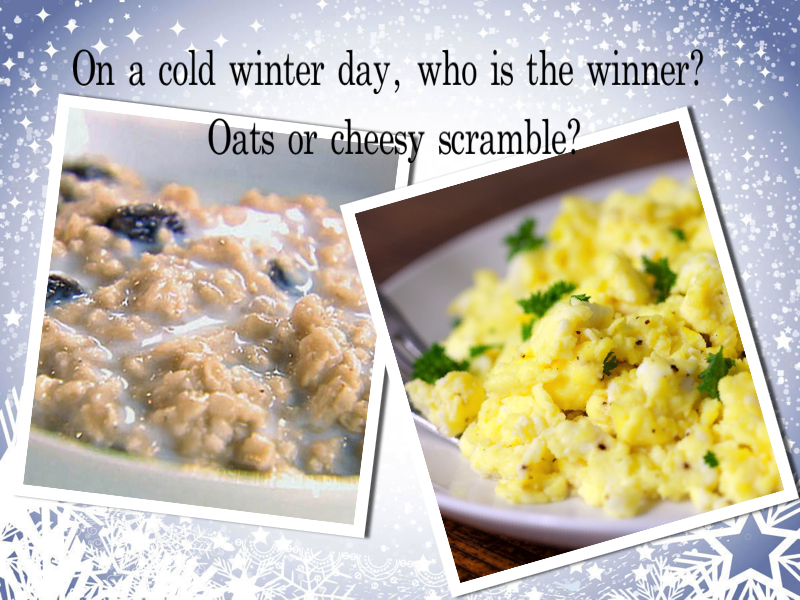 erm….i cant decide …cos i love both oats and scramble…im a foodie…i think that’s d issue here..hehe..
Mmmmm oats! I just had a big ok bowl of oats with cinnamon and raisins and a bit of maple syrup! I love how easy it is to make(90secs in the microwave)and they keep me satisfied! I have two little kids so easy it is or I don’t get to eat! Sounds good! I am a big fan of fast and easy! Rolled oats also boost breast milk production, wahoo! Right now, I have to have eggs and whole grain toast for breakfast or my tummy attempts a revolt. Pre-pregnancy I was fine with a bowl of whole grain cereal. Rolled oats are instant is you prep them the night before – add your almond milk/water whatever and let them soak overnight. In summer I eat them just like that with yoghurt, in winter 2 minutes in microwave and then you have well cooked easy porridge. I’m an egg girl myself! Gotta get in my protein. I don’t eat oats anymore, but, I will say that refrigerator oatmeal with steel cut oats and strawberries was probably one of the best things ever! Sounds good. Are you doing strict LCHF is that why you’re not eating oats anymore? Weet-bix with no sugar, just milk. Although I often just have fruit at work, or if I’m home one piece of toast, avocado, mushrooms, baby spinach and a poached egg. Equivalent to a little over 300 calories but keeps me full until well into the afternoon. It’s my weekend brekkie!